Tenderly is written in the key of Eb Major and has an impressionistic character similar to that are early Debussy. The tune has a 32 measure A-B1-A-B2 form which repeats the same melodic figures and motives throughout. 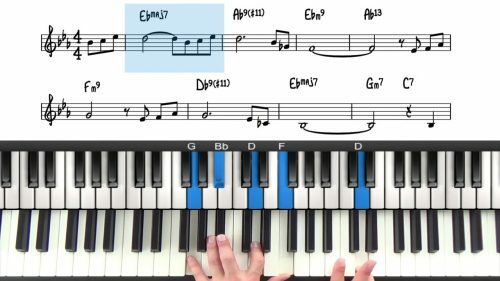 There is a melodic motive that repeats throughout to give the tune its character. A motive is a musical idea, usually a recurring idea which contains a short succession of notes. The motive in Tenderly rises up and then drops by a minor second interval. 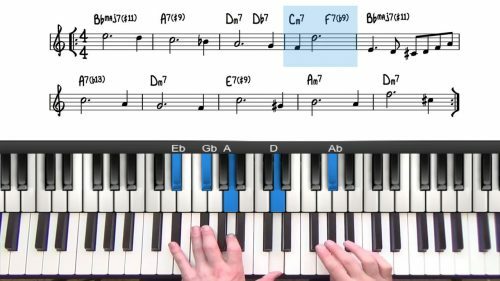 The melody of tenderly contains many extended and altered tensions making this a great tune for exploring the upper extended and altered harmony. We start off with simple voicings and then gradually increase the complexity of the chords we choose to play. Tenderly has been recorded by many notable jazz musicians so have a search around the web and find some records that you can draw inspiration from. It's also often played in 3/4 which adds a different dimension to the tune. Check out the Bill Evans recording of this tune as an example. 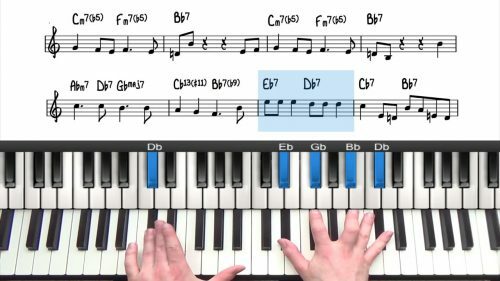 Once you are familiar with this simple arrangement, move onto 'Tenderly Improvisation Tutorial' where we add upper structure triads and improvise over the form.